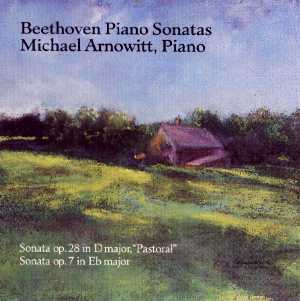 Michael Arnowitt's latest CD is his first Beethoven recording, featuring the "Pastoral" Sonata no. 15 in D major, op. 28 and the Sonata no. 4 in Eb major, op. 7. The sonatas were recorded in the outstanding acoustics of Toronto's Church of St. Martin-in-the-Fields. The compact disc has 62 minutes of music and can be ordered from Ursa Minor Records. You may be interested in reading about Beethoven & Arnowitt, Michael's live performance project to perform all the Beethoven sonatas chronologically, matching his age at time of performance with Beethoven's age at time of composition. Michael's next recording will be Homage to Glenn Gould, due out by the end of 1999.